When I decided to start the blogging "adventure" I did not know if I would go on for long, and if I would not be too shy to show my humble work compared with all the marvellous creations of the other bloggers. At the end I enjoyed so much blogging and especially having contacts with such nice people and wonderful quilters that I forgot about my shyness, and that one year passed without I realized it! It is so fantastic to meet people from allover the world! Thank you to all my blogger friends, quilters and not quilters! I know completely what you mean - sharing work at first is kind of hard - but then you get into blogging and sharing and it is fun - I have more in common with my blogging quilt friends then anyone I actually know! Longue vie a ton charmant blog !!! Congratulations on your blog anniversary. I always enjoy reading your posts and seeing the wonderful projects you are working on. It has become an important part of my life, but it has also encouraged me in being more creative, meeting so many wonderful people along the way, from whom I have learnt so much. Here is to many more happy blogging years! quilts! Congratulations on 1 year of "Quilting Stories" !!! Keep blogging Christine! Happy anniversary, Christine! I love to read your posts. I love the virtual quilting group we've all created. Look at everything you have created in a year!! I am so glad to have found your blog and always love stopping by for some wonderful inspiration! I love your clean, classic style!! Congrats Christine!!!!!!!!!!!!!!!!! Happy Bloggiversary!! So glad you started to blog because I love to see what you have made. Here's to so many more years! Congratulations Christine on your first blog anniversary. Always enjoy seeing what you are making. It´s my blog anniversary too today and you still have time to enter my giveaway. Happy anniversary Christine, your blog is charming! Yes, Congratulations. Yes, Happy Anniversary. But HUGELY, thank you for blogging. Your blog is a wonderful visit that I look forward to. Only one year? You're such a professional, I would have thought you've been doing this forever. Congratulations and thanks for always sharing such beautiful photos of your projects! Happy blogging anniversary! I'm glad you found the courage to show us your inspiring creations. This quilt is elegant and charming, like all of your works. 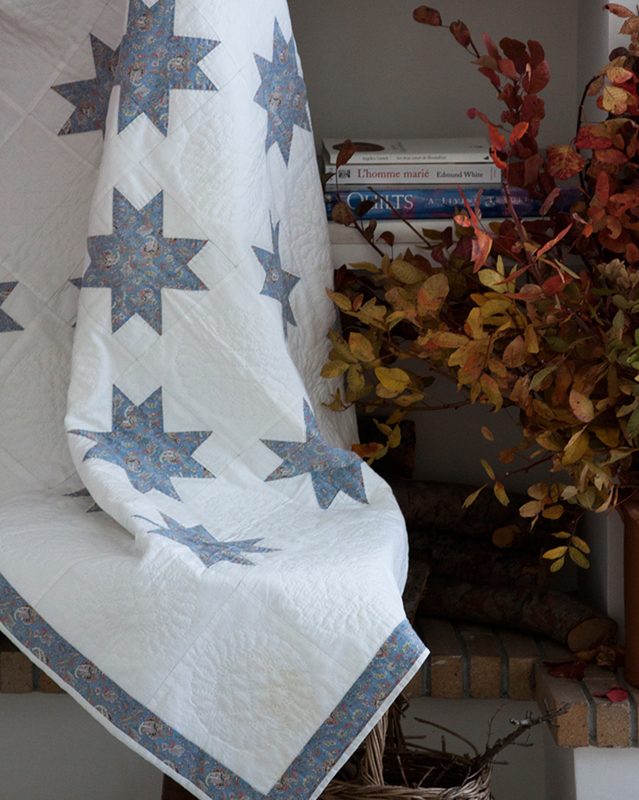 I love your style, and look forward to seeing many more of your beautiful quilts! I have not been at it for a year yet but I, too, am loving the adventure. I'm so glad to have found you! Congratulations on this anniversary! I am glad to have met you via blogging.